I believe I could actually make these cutesy flower accents from I'm More Than Just a Mom. Aren't they fun? 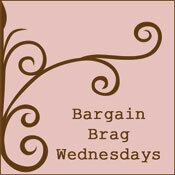 There were just so many wonderful projects from last week's Bargain Brag Wednesday. I loved them all!! Thank you all for sharing your wonderful ideas. I have some bargains just nothing to brag about yet! I so want to go to ikea to get some mirrors. 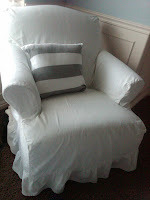 I passed two up recently at the thrift stores and then I saw two makeovers using them...argh! You'd be proud...I won a HUGE container of some magnesium bath flakes to use on Evie's eczema...so thankful! !